» Is Your Dog Happy? We’ve all heard the old adage “A tired dog is a good dog.” This adage has led us to placing all our focus on TIRE OUT THE DOG! We’ve got a plethora of new industries to help us TIRE OUT THE DOG. Dog Daycare, Dog Walkers, Dog Jogging, Dog Biking, Dog Park Adventures, Dog Agility, and Lure Coursing among the many dog services. iFetch, Dog Puzzle Toys, Chuck-it and oodles more dog products to assist in tiring out our dog.While I’m a HUGE fan of all these new innovative industries to help solve our dog problems, I’m also concerned much of what matters to us dog parents has been lost. Friendly & sociable dogs able to go with us anywhere. Are you always better behaved, sociable and friendly when you’re tired? How about kids? When I think about this for myself the first thing that comes to mind is H.A.L.T. When crabbiness rears it’s ugly head, especially in my interactions with others, I turn to HALT. Am I hungry? Am I angry? Am I lonely? Am I tired? Any one of these will rob me of happiness, which in turn can lead to a very crabby Jody. All of these affect our dog’s happiness as well. In this article we’ll focus on the “T”. Tired: at first thought this seems simple enough to rectify, go to sleep. As a grown woman that’s required to ADULT every day, sleep is often a luxury. A luxury I cannot indulge in whenever the desire arises. Dang it! So now you’re thinking, my dog certainly doesn’t have to adult. She can curl up and take a snooze whenever she wants. But can she? When my recently adopted rescue puppy Vanna gets over-tired she fights sleep, much like a human toddler. You can see she’s very sleepy as her eyes get heavy and her head bobs fighting off entering sleepy land. We often joke, she’s just like a toddler, she’s afraid she’ll miss out on something. When Vanna fights that much needed sleep, she gets less tolerant of others around her. Just like a human child, she gets crabby and that affects her social interactions. Tired Vanna doesn’t always equate to good Vanna. When Jeannie and I ran our doggy daycare we knew a mid-day nap was essential for the dogs in our care. Most of the dogs were at doggy daycare to play all day, some up to 10 hours in one day. Imagine being on the basketball court for 10 HOURS straight! Would you be able to go curl up and take a nap on the court as others are still running around playing? Imagine mid nap the basketball bonking you on the head or another player landing on you in full run. Would you be able to relax, let alone actually snooze? We knew it was in the dog’s best interest to be given a cozy safe place to snooze or crabby dogs would inevitably appear for the second half of the day in play. We also knew sending home an over-tired crabby dog was not what our clients truly wanted. Our dog families wanted happy, good and well-behaved dogs returning home at the end of the day. This is why I also concluded doggy daycare for up to 10 hours a day, 5 days a week is not in the best interest of you or your dog. Fortunately more and more doggy daycares have gotten on board with this, limiting the number of days a week a dog can attend. As you can see a tired dog doesn’t always equate to a good or well-behaved dog. Over-tired shows up as crabby and wreaks havoc on the one thing that matters most in our family dogs…sociability. We want our dogs to ALWAYS be friendly in all interactions with others, humans and other dogs. 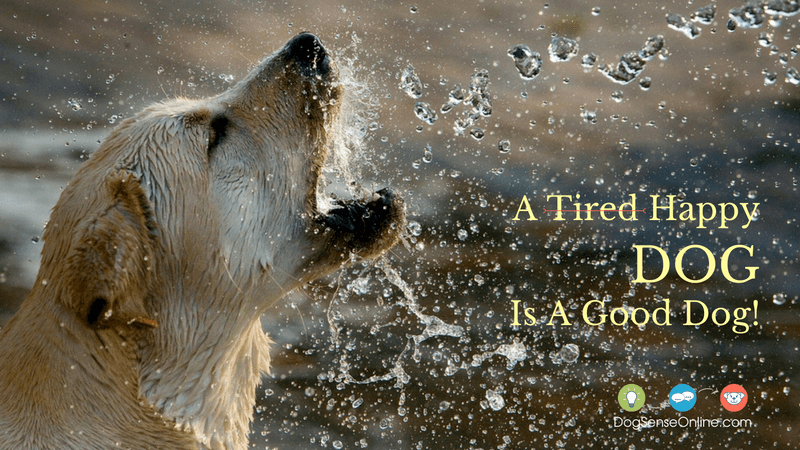 Tired doesn’t always lend itself to Happy, Friendly and Sociable. Okay, A HAPPY dog is a GOOD dog! So what’s the RECIPE for a Happy Dog? A Life of Balance…Mind, Body and Soul. Sound familiar? Dogs are much like us, minus complex language skills and the stories derived from language. Your dog needs the essentials: Food, Water, Shelter, Exercise and Enrichment. But the essentials are not enough for us to fully achieve happy nor is it enough for our dogs. If you want good, well behaved & friendly…you want a Happy Dog. Mind (Emotional Wellness): Sad, lonely, angry & frustrated along with many more emotions are felt by your dog. I personally have been guilty of not recognizing one or more of these emotions in my dogs. In our modern world of multi-tasking to get it all done, we’re less present with those around us. Those we love. We often don’t SEE them and how they’re coping in a particular situation. This goes for our dogs too. Your dog will never be able to tell you through words when she’s upset, hurt or not coping well. You can however SEE how your dog is coping in most any situation if you know a bit about dog body language. When you’re present with your loved one (human or dog) seeing with your eyes when they’re not coping well, you can help them through whatever they’re experiencing. You can be there for them before a total meltdown ensues. Don’t let your dog reach meltdown. Your dog needs you to be there for her, just as you would for any other family member or friend. If your dog does reach the point of an emotional outburst, don’t make it worse by yelling at her. Don’t use the leash to correct her. Don’t get into a power struggle with her. She’s not emotionally coping well. Be there for her. Take her out of the situation that is now clearly upsetting her. If this is a situation she will encounter again, you’ll want to teach her the coping skills she needs for it. She will most likely be able to get there…but she’ll need a kind and thoughtful approach. Body (Physical Wellness): No doubt, exercise and enrichment helps keep our bodies well and is a necessary part of everyday life. Most dogs’ physical health is better tended to than previously. Take your dog to your veterinarian for yearly health checks, vaccinations as needed and whenever your dog appears to not feel well. Poor health and/or pain erode happiness. Take great care of your dog’s physical health through adequate daily exercise, enrichment & healthcare. Soul (Connection): Connection is what feeds the soul for both humans and dogs! Do you UNDERSTAND your dog? Do you know how to COMMUNICATE with your dog in a way your dog can clearly comprehend? Feeling misunderstood and breakdown in communication is soul crushing. Both humans and dogs crave CONNECTION, it feeds our souls. True connection between two individuals (human or dog) is achieved through understanding one another and clear communication of each other’s wants and needs. Your dog is always trying to communicate with you. When she’s happy & when she’s upset. When she wants or needs something. Learning to speak dog is not difficult at all, but it is different from how we communicate as humans. Dog Body Language for understanding your dog’s emotional state and simple words or short phrases used consistently can enhance the dog and human connection. Leading to the most sweet, simple and pure relationship of your life. And best of all, happy human and dog! Adequate Exercise For Dogs Is Vital, But Not At The Exclusion Of Everything Else. I’ve watched and participated in the growth of dog daycare and dog parks over the past decade. There are few other activities your dog can participate in that will expend the ya-ya’s more than playing with other dogs. It’s the activity my personal dogs love most. But exhausting your dog through exercise and dog play doesn’t fulfill your dog’s needs in full. Sometimes too much of a good thing can backfire when we neglect other important areas in achieving a happy and fulfilled life. This applies to your dog too. Keep your focus on a HAPPY dog, achieved through Mind (Emotional Wellness), Body (Physical Wellness) and Soul (Connection). Your dog will reward you in return by being A GOOD DOG. Do you have a new puppy or rescue dog? Would you like to learn more to help your social dog enjoy a social lifestyle? Get your DogSense & enjoy your dog! It’s more than your usual dog training class. It’s a learn-at-home & at-your-pace dog behavior & online dog training eCourse. All Specifically designed with you and your social family dog in mind.